Header reprinted (adapted) with permission from Peterson et al. J. Am. Chem. Soc. 2018. Copyright (2018) American Chemical Society. Authors: Peterson, J. A.; Wijesooriya, C.; Gehrmann, E. J.; Mahoney, K. M.; Goswami, P. P.; Albright, T. R.; Syed, A.; Dutton, A. S.; Smith, E. A.; Winter, A. H.
When you’re under the weather, you probably don’t spend a lot of time thinking about how drugs are delivered inside the body. 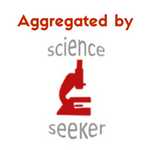 But much of modern medical research focuses on developing more targeted treatments. Your antiviral will be a lot more effective if it’s fast-tracked to the virus – and you can avoid a whole lot of nasty side effects (read: vomiting) if your antibiotic only targets the region of your body where it’s needed! Figuring out how a drug can move through the human body intact, to be deployed only in a specific region, is easier said than done. A recent paper from Iowa State University describes one tool for overcoming these challenges: the photocage, a light-sensitive molecule that attaches to the drug to be delivered. As the name implies, photocages trap a drug by making it chemically inert: meaning it can’t react with anything as it passes through your body. When your doctor illuminates the part of your body where the drug is needed, the photocage releases and the drug can get to work in your body. One drawback to the most studied photocages so far – which include o-nitrobenzyl and its derivatives – is that they mainly absorb ultraviolet (UV) light. UV light is not ideal for medical applications, as it causes cell death. Instead, the ideal photocage should absorb light of a longer wavelength (600 to 1000 nm), which is less toxic while still penetrating the tissue containing the photocaged drugs. Figure 1. An example of a BODIPY-based photocage with attached “cargo” (a drug to be delivered). After the photocage is treated with light (512 – 693 nm), the cargo is released. The R2 position substituent is varied to optimize the photocage. Reprinted (adapted) with permission from Peterson et al. J. Am. Chem. Soc. 2018. Copyright (2018) American Chemical Society. That’s where the latest paper from researchers at Iowa State University comes in. 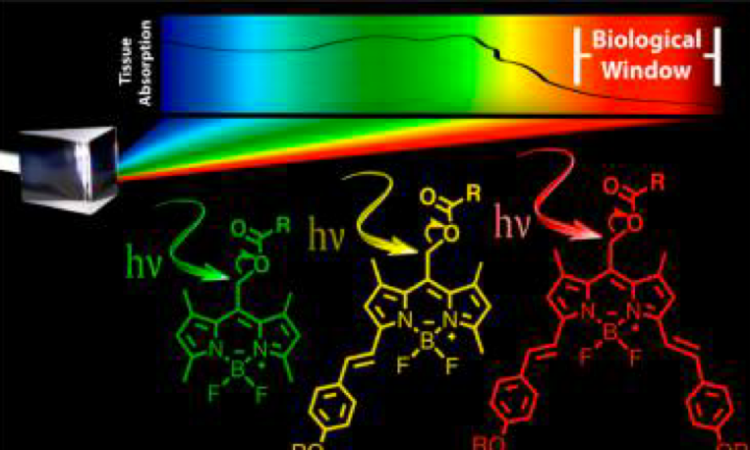 They synthesized a new class of photocages based on BODIPY (which stands for meso-substituted boron-dipyrromethene) dyes (Figure 1). Depending on their substituents (attached to the R2 position, as in Figure 1), these dyes can absorb light with a wavelength between 512 and 693 nm. This light falls within the visible spectrum, which is much less toxic than UV light, so these photocages are an improvement on previous iterations. Figure 2. . Fluorescence images of HeLa cells. A-D show cells containing photocage and irradiated with 635 nm light, causing photocage release and fluorescence; E-H show cells without irradiation as a control. Reprinted (adapted) with permission from Peterson et al. J. Am. Chem. Soc. 2018. Copyright (2018) American Chemical Society. To prove that these photocages will actually deliver their cargo in real cells, researchers added them to HeLa (human, from Henrietta Lacks), bovine (GM07373) and fruit fly cells (Drosophila S2). BODIPY photocages were first attached to their cargo: a molecule called 4-nitrobenzoic acid that quenches BODIPY’s fluorescence. After the photocages were irradiated, they released 4-nitrobenzoic acid and began to fluoresce (Figure 2). Researchers then examined the cells for any sign of damage, but no decrease in cell viability was observed for illumination with 635 nm light. Success! While further investigation is needed before BODIPY photocages are set loose in live bodies, so far all signs are promising. This technology is a long way from FDA approval, but maybe someday your doctor will be shining light on you, too!